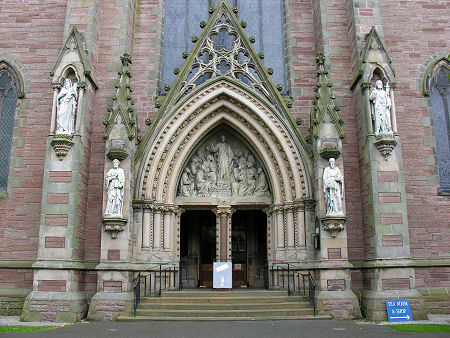 Inverness Cathedral, or the Cathedral Church of St Andrew, Inverness, is an imposing building constructed in pink sandstone. It stands close to the west bank of the River Ness and looks across the river to the city centre and to Inverness Castle. 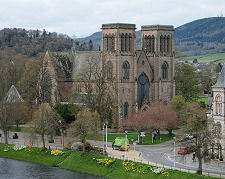 Inverness Cathedral was built between 1866 and 1869 by the Inverness architect, Alexander Ross. Gothic in style, the exterior of the cathedral tends to attract slightly unflattering comments in architectural guides, and there is no denying that it would have looked rather prettier, and still more imposing, had the funds stretched to include the 30m spires the architect originally intended to top off the west towers. 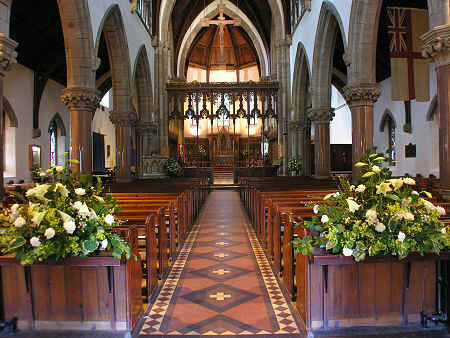 The original designs also envisaged a church with a rather longer nave. Having said that, the main west doorway and its surrounds are truly magnificent, and provide a fitting entrance to a building which is much more appealing internally than externally. 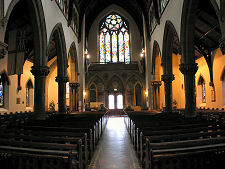 The Cathedral is Mother Church of the Diocese of Moray, Ross and Caithness, one of the seven Dioceses of the Scottish Episcopal Church, which is part of the world-wide Anglican Communion and can trace its history back to St Columba and the early days of Christianity in Scotland. Like its sister-church south of the border, the Church of England, the Scottish Episcopal Church is governed by Bishops. This is one of the things that distinguishes it from the much larger Church of Scotland, a Presbyterian Church governed by representatives of the congregation. This may not initially sound like a major difference, but it was King Charles I's efforts to impose government by Bishops on the Presbyterian Church of Scotland which led to a riot in St Giles' Cathedral in Edinburgh on Sunday 23 July 1637. This in turn led directly to the Bishops' Wars; the Wars of the Covenant; the English Civil War; the execution of Charles I; and Cromwell's occupation of Scotland: 23 years of wide-ranging conflict that did not really end until the restoration of Charles II in 1660. Those days are, thankfully, long gone, but it helps to know that differences of opinion about church governance were once, quite literally, a matter of life and death. Although a minority denomination across the Scottish population as a whole, it was estimated in the mid 1800s that three quarters of the "landed proprietors of Scotland" were Episcopalians, a by-product of so many sons being educated at English public schools. 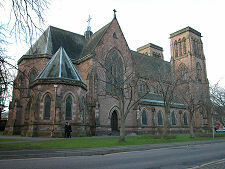 One result was an explosion of Episcopalian church building in the second half of the 1800s, and one product of that was Inverness Cathedral. Internally, the cathedral seems considerably larger than you expect, and you get a sense that this was where most of the effort, and available funds, was expended. 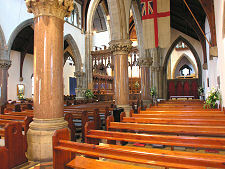 The nave is separated from the aisles by columns made from Peterhead granite, and the fixtures and fittings, from the pews to the floor tiles, are all of the highest quality. 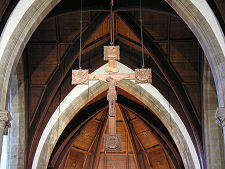 The nave is separated from the choir by a beautiful oak choir screen added in 1923, above which is suspended a large cross. The choir itself is nothing short of magnificent. 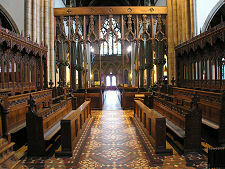 The choir stalls were made from Austrian oak and added in 1909. 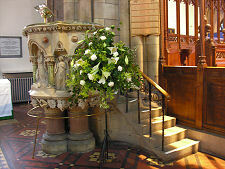 The bishop's throne dates back to 1869. 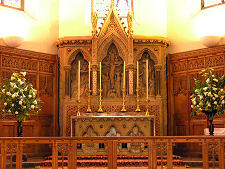 At the east end the altar and the reredos, the carved screen behind the altar, finish off this end of the church in a very pleasing way. Both were made from stone imported from Caen. 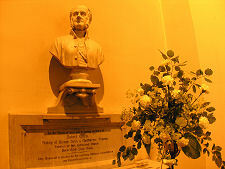 Inverness Cathedral has a number of statues, including a large angel carrying a font and a bust of Bishop Robert Eden. 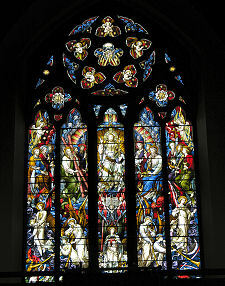 It also has an impressive collection of stained glass windows. 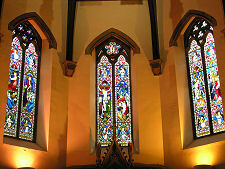 Perhaps the best is the beautiful west window, in the gable immediately above the west door.